Two stories that scrolled across my vision today got me thinking. I'll put aside, for the moment, the merits of the suggestion, because what really interested me was the way the story came to light and the reaction to it. 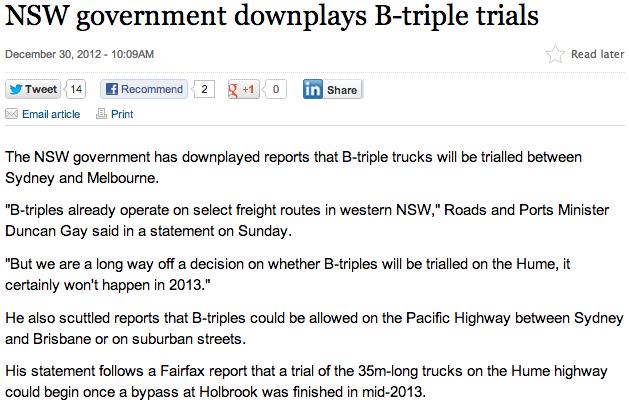 Firstly, the story makes no appearance on the Daily Telegraph website until later this morning. I don't have a paper copy of today's Sun Herald, so I can't check if EXCLUSIVE was brandished across the cover, but I think we can safely assume that this story is based on information that only the writer (Jake Saulwick) had. The story does not make it clear where the information came from, but I think the lack of anything on the Daily Telegraph website means this must be information that was leaked directly to Saulwick. Interestingly, whilst the previous story included quotes only from a "spokeswoman", this story has a direct quote from the Roads Minister himself downplaying the story. The story also attributes that quote to a "statement on Sunday" which is clearly well after the original quote was provided by the "spokeswoman". Obviously it is exactly the same copy, pulled off the AAP wire. So, where did the initial story come from? One possibility is that the story was leaked by Gay's office to "test the waters" - to gauge the media and public's reaction before deciding on whether the idea had legs or not. That is a possibility - but in my view the negative reaction was practically inevitable. Why the information would need to be leaked to ascertain that is a little difficult to imagine. I say this notwithstanding the comment on the initial story from the "spokeswoman" - it's likely that Saulwick had the story and (appropriately) sought comment from the Minister's office before it was published. Another possibility is that the story was accidentally leaked by someone with a big mouth. It's possible, but also seems unlikely. What's far more likely is that someone wanted the story leaked because they knew what a negative reaction it would garner, the theory being that it might help to push the minister into not allowing it to go ahead. Exactly who that opponent may be is impossible to tell. The minister's office has no motivation to cast the plans in a negative light, the opposition is apparently in favour of the plans, and the quote from the Cate Faermann (Greens Upper House member) is buried in the final paragraph. 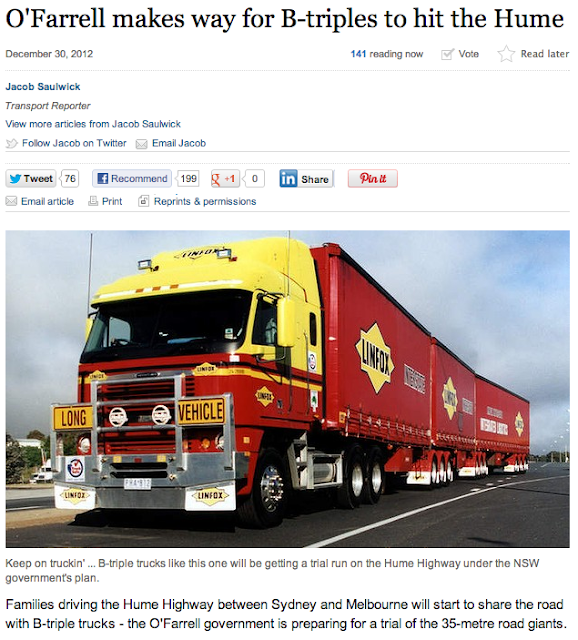 Moreover, the trucking industry is in favour of the plans. So who gave Saulwick the story? I don't know if that businesswoman has been consulted about the plans or got her hands on relevant material and passed it on. If so, I'm also not suggesting that she did anything illegal or wrong. But if I've guessed right, it certainly is an interesting insight into the way that politically sensitive information like this can leak into the newspapers, and the way that debate can be shifted as a result. 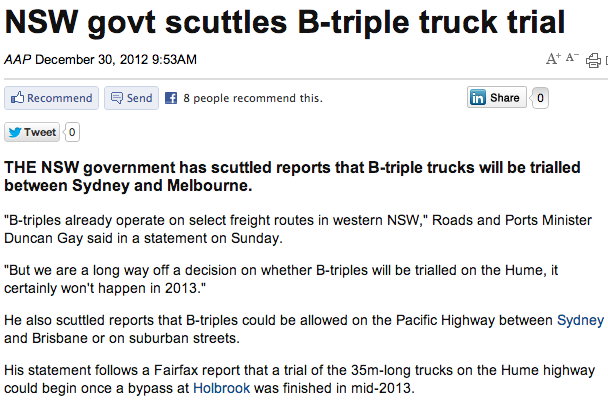 We'll have to wait and see what the Minister does.